Diabetes is caused by eating too much sweet food. People who use insulin have poorer diabetes control than those who use only oral medicines. People with diabetes will always end up having to amputate their feet. People with diabetes should not eat carbohydrate as carbohydrates can raise the blood sugar level. People with diabetes can safely eat snacks/candies which have “no added sugar” or are made “suitable for diabetics”. Diabetes is not directly caused by eating too much sweet food. It is a long term medical condition where the body cannot produce insulin and/or respond to insulin well. This causes high blood sugar levels as insulin is needed by our body to lower blood sugar levels. A diet that is high in sugar can cause obesity, which increases the chance of developing diabetes. Diabetes is a long term medical condition that has no cure. However, diabetes can be prevented from becoming worse with a healthy diet, exercise and taking medicines as advised by a doctor. This will prevent the development of problems from having high blood sugar levels. Pancreas is an organ in the body that produces insulin. The pancreases of people with type 1 diabetes are unable to make insulin. Oral medicines that work on the pancreas would not have any effect in this group of people. Hence, the only way for them to control their blood sugar is to inject insulin. For people with type 2 diabetes, doctors normally choose to treat them with oral medicines first. However, some people might need a combination of oral medicines and insulin injections to control their blood sugar better. Needing insulin does not mean that someone has failed to manage their diabetes well. Insulin is just one of the choices of medicine doctors use to help control blood sugar levels. People with poorly controlled diabetes often have damage in their blood vessels. This can cause kidney disease, blindness, heart disease and stroke. Damaged blood vessels can also cause foot ulcers to form, which might lead to a foot amputation. However, such problems can be prevented or delayed if sugar levels are well controlled. The earlier blood sugar levels are under control, the lower the chance of developing serious problems because of diabetes. It is important that people with diabetes visit their healthcare providers regularly to check for diabetes related problems of the foot, eyes and kidney. Carbohydrates are digested by the body into sugar to provide energy. Hence, it can raise the blood sugar levels. 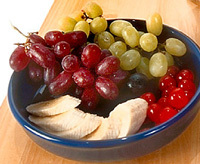 Carbohydrates can be found in a variety of food, including fruits and vegetables. As these are important sources of vitamins and nutrients, it is not practical to avoid carbohydrates totally. Talk to a dietitian to learn more about healthy eating and managing the amount of carbohydrate in your meals. Snacks and candies marketed as “no added sugar” or “suitable for diabetics” might seem to be attractive alternatives for people with diabetes as they seem to have less sugar. It is important to understand that “no added sugar” does not mean “no sugar”. Instead it means that there is no additional sugar added on top of what is already present. For example, a fruit juice might state that there is “no added sugar” but, there is already sugar naturally found in the fruit juice. These natural sugars can also increase the blood sugar levels. Products marketed as “suitable for diabetics” are normally sweetened by artificial sweeteners and should not increase the blood sugar levels. However, snacks and candies are generally not very nutritious and can be high in fat. It would be a good practice to take a look at the ingredients before eating and to take them in reasonable amounts.